The article presents sketches of a systemic assessment of the foreign policies of the four Visegrad countries. Its ambition is to move beyond the superficiality of merely recounting past successes and failures of V4 cooperation while rhetorically restating aspirations for a dream-world of Visegrad partnership. To this end, it applies elements of the conceptual repertoire of Foreign Policy Analysis (FPA) to highlight key issues structuring V4 relations and why in their foreign policies these countries do not fully “click”, or, in other words, are not capable of playing a truly meaningful role together on the world stage. The concepts of role-making, ratification, normalisation (as in prospect theory), national identities, as well as a look at the role of interest groups all have some insights to offer in this respect. The aim is to arrive at a tentative assessment of the Visegrad countries’ foreign policy-making peculiarities, with the intention to illustrate the possibility of, as well as to invite further, more profound research on the subject. The article explores the coherence of the Visegrad’s foreign policies towards Russia, by assessing both the national positions and the role of the International Visegrad Fund. The most important common elements of the V4 countries’ Russia policies are the shared hard security interests and similar positions in energy security. The main differing factors are the missile defence project and the place of human rights on national Russia-oriented foreign policy agendas. 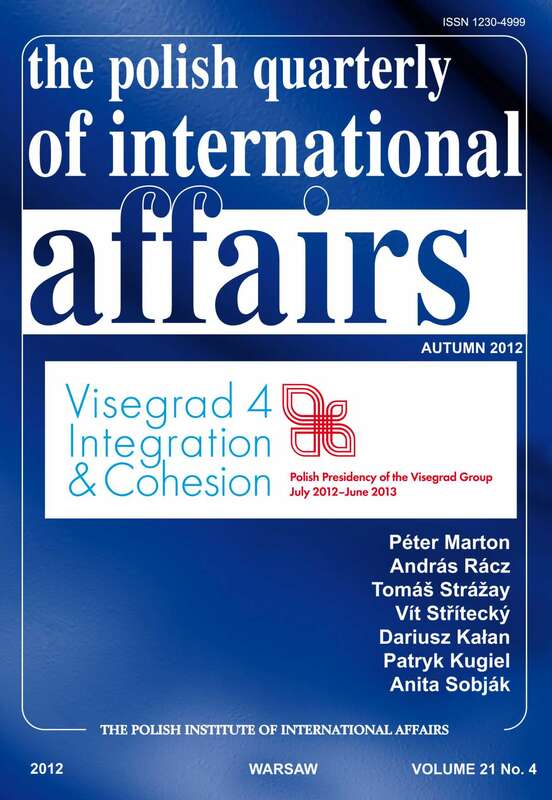 Finally, the Russia-related activities of the International Visegrad Fund are examined and reveal only limited interest in using the V4’s sole institution to establish broader contacts with that country. The Western Balkans ranks high among the foreign policy priorities of the V4 countries and also represents one of territorial priorities of the Visegrad Group. The article aims to assess the current and future possibilities of cooperation between the Visegrad Group and the Western Balkans. Rather than analysing the involvement of particular V4 countries in the region, it focuses solely on the role played by the Visegrad Group as such. Besides mentioning the fields of ongoing or future cooperation, the article also focuses on the main obstacles that might prevent cooperation from developing. The current economic difficulties noticeably represented by the European fiscal crisis have stimulated and reinvigorated calls for deeper regional cooperation in the defence sector. Before suggesting some areas of potential cooperation, this article indicates that a large amount of resources have been wasted due to highly ineffective defence and strategic planning. This position will be confronted with arguments claiming success in the consolidation of Central Europe’s armed forces. It follows that seeking a remedy in regional cooperation will be both possible and effective only after the reforms bring about a real consolidation of national defence sectors. It seems that for the U.S., Central Europe has already lost the geopolitical uniqueness that captured Washington’s attention at the end of the 1980s and into the 1990s. Significant differences between the two sides regarding global threats as well as the gradual fragmentation of the region have meant the U.S. has ceased to see Central Europe from a strategic perspective and instead has focused on its more immediate economic, energy and security needs as pursued through bilateral channels. In the future, the relationship between the two may be reinforced, though only if Central Europe is able to formulate common priorities with one voice, a challenge especially for the Visegrad Group. Despite many complementarities and shared interests, the V4 countries seem more often to compete rather than collaborate in areas of international development cooperation. This paper is an attempt to trace the major similarities, analyze the stumbling blocks and show some of the ways the V4 countries can join their efforts in this area. It argues that the V4 countries can do much more together, especially in the Eastern Partnership, in which they already participate and where their transition experience is the most relevant. With the European economic crisis meaningfully reshuffling the political and economic constellations in the EU, Member State alliances have increased in significance because of the complex reform processes being undertaken. These volatile combinations create both a necessity and an opportunity for the V4 to rethink the mission of the regional grouping. A comprehensive account of V4 activity suggests that the areas in which cooperation is bearing the most fruit are energy security, civil society cooperation and policy towards the eastern and southeastern neighbours. The most effective route for the V4 is to further streamline its strategies and pool resources in policy areas with the highest potential, without the pretence of covering all areas.